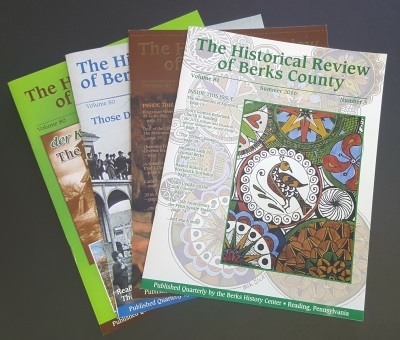 For a pre-paid fee, a skilled volunteer or staff member can investigate materials available in the Berks History Center’s Research Library collections and respond to your historical or genealogical research request. We will provide photocopies of primary resources to assist you with your research. HOWEVER, we cannot accommodate complex questions requiring original research and substantial interpretation of our primary sources. While we cannot guarantee results, we will make every effort to help you by documenting all sources consulted during our research. Staff and volunteers will indicate if additional research time is needed and will often note where further information can be found. We answer research requests on a first come, first serve basis. We will do our best to complete your request within 2 to 3 weeks, except during the summer, which can average roughly 4 to 6 weeks. PLEASE NOTE: WE ARE NO LONGER ACCEPTING RESEARCH REQUESTS THROUGH EMAIL. ANY RESEARCH REQUEST SUBMITTED WITHOUT PAYMENT WILL NOT BE ANSWERED. Copies can be made for a variety of documents in our collection. This includes our archival collections and vertical files. Staff reserves the right to refuse a request based on the physical state of the document and its size. $15.00 for all other files up to 10 pages, additional pages $0.50 per page (up to 11” x 17”) for items that have not been inventoried. Items that are larger than 11” x 17” are covered under the Digital Images Section. We only have the ability to scan up to 18” x 24”. Anything larger than 18” x 24” cannot and will not be reproduced. PLEASE NOTE: We cannot reproduce entire collections for research. Please visit Collection Search to view descriptions documents within our collections. ALSO NOTE: Books found in the library stack room are not included under this category. There is a ten page copy limit in effect for all books. Deeds in our collection are excluded from the Document Retrieval request. Due to their size, we are unable to reproduce them. Photocopies can be made of the photographs in our collection, and is the preferred method of the Historical Society. However, if needed, digital scans can also be made from our photograph collection. Additional Fees will be included for images used for publication or exhibition purposes.